FREE PATTERN: Devon & DEALS! Hello Friends, Happy October to you!!! We have had rain over here for the past few days, and are expecting rain for the rest of the week as well as the weekend. The chilly weather with the rain makes me want to just stay at home in my PJ’s, and do nothing! But of course, I am not brave enough to do my school runs in my PJ’s…. yet! Ha! 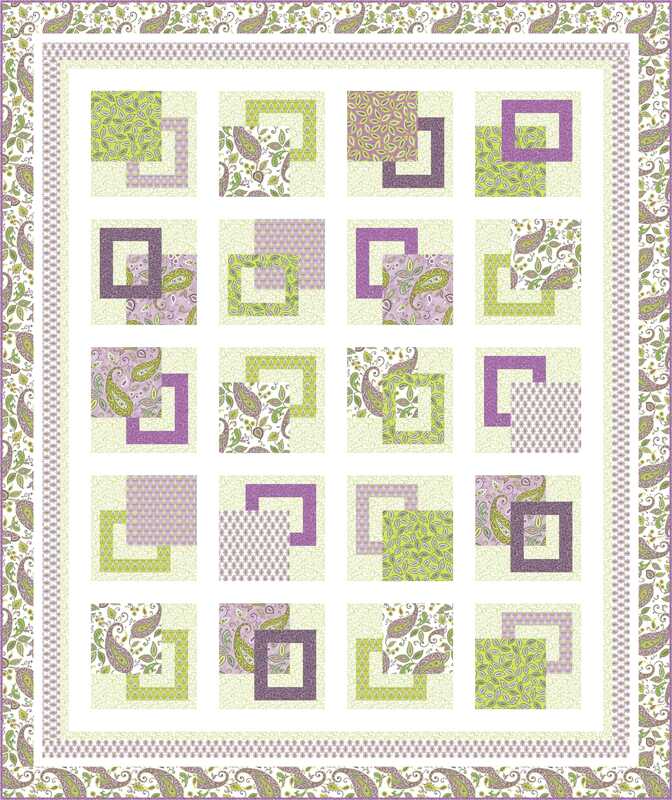 I am happy to share with you about Devon, another newly released line by Quilting Treasures. I had designed the following free-to-use pattern to highlight the Devon fabrics. So what do you think of the green/purple color combination? And the paisleys? You know how I adore paisleys!! #1. So… I saw the following photo on dear friend Lynette Anderson’s Facebook page. You remember my Making Valentines quilt that was featured in McCall’s Quilting’s March/April 2015 issue? You may click here for more pictures of quilt details. 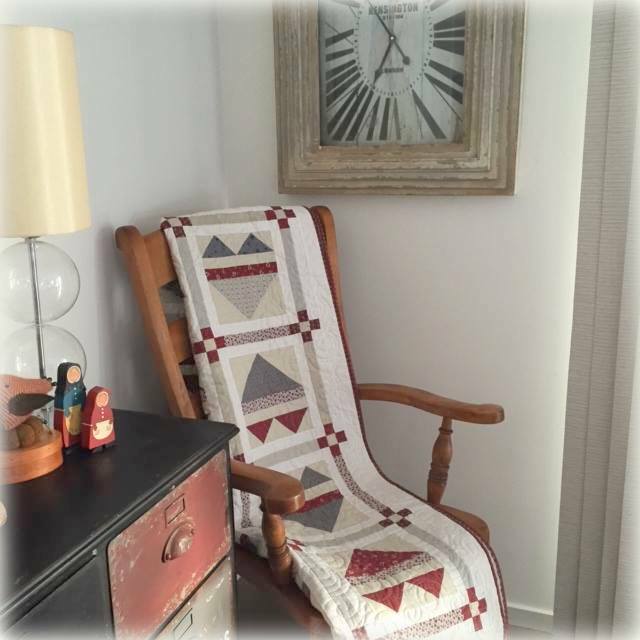 So back to the following photo — I have gifted the quilt to Lynette earlier this year, and she now has it displayed in her house in Australia. I am so touched. You may still purchase the exclusive kits, now on sale here. #2. 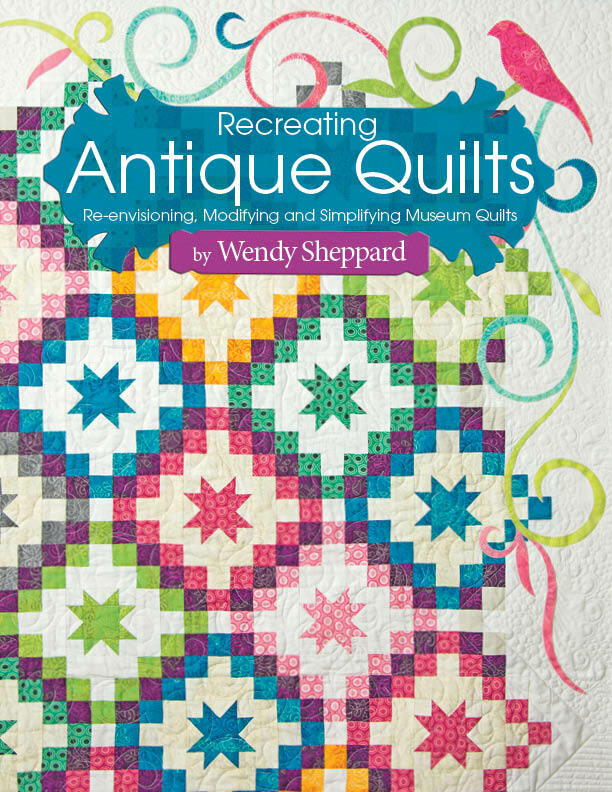 My book Recreating Antique Quilts is available from Landauer at 50% off right now. Click here to purchase the book. And that’s it for today. I just started on another project that needs to go out early next week. So I’d better get going for now. I shall catch up with you later! This entry was posted in Quilt Pattern, Quilting, Quilts & Projects: Published, Quilts: Pieced and tagged Free Quilt Pattern, Landauer Publishing, Lynette Anderson, Making Valentine's Quilt, McCall's Quilting, Quilting Treasures Devon, Re-interpreting Antique Quilts, Recreating Antique Quilts by Wendy Sheppard, Valentine's Day Quilt, Wendy Sheppard Designs. Bookmark the permalink. That is so neat!!!! Quilts are the perfect “prescription” for cool, wet, dreary days!!!! Take care…hugs……. I really like the purple and green. I made a quilt using those colors before. I really like the colors and the design of this quilt! Thank you for sharing and have a wonderful creative day! The design of the quilt is very nice. Pretty color combo! And love the quilt pattern! Thanks for the link. I’m going to go check out your book right now! Have a wonderful, funderful weekend! The green and purple is very pretty. Thanks for the pattern, not to buy the fabric. I also ran around in my PJs in the car bring the girls to school. One time Lizzie was driving my mom’s old car to school with her learners permit. I was in the passenger seat looking like … wll, I had just rolled out of bed. The car broke down in the school parking lot. I could not restart it…. long stupid story, but the most humiliating part was looking so rumpled and in my pajamas talking to the school officer as he was telling me I had to remove the car immediately. I called my hubbs of course. I learned a lesson. :-P as I looked so hideous.